Those tatted up so cute! I downloaded the pattern early this a.m., so I'll make one this evening! Jane's sister?! I didn't realise that! I even saw the pic of the 2 of you & didn't make the connection. LOL! Oh, BUMMER. Now I'm gonna have to find my 'mixed up' beads to make some like yours!!!!!! They are just SO addictive!!!! Every day, that bauble is looking more and more tantalising! So cute... the little butterflies! one look and we know you and jane are related—same tatted items! now i'm even more envious... lovely butterflies. Hello Sally, love all your tatted butterflies!! Gorgeous colors. I just printed Jane's pattern, and hope to tat it over the holidays. I bought some really nice bead mixes from DS9Designs. 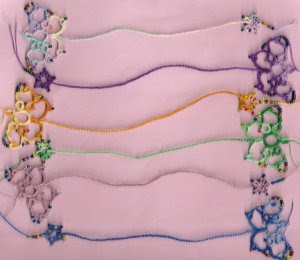 I've been matching the bead mixes with some of the new Lizbeth threads and I'll thy them out on this pattern. 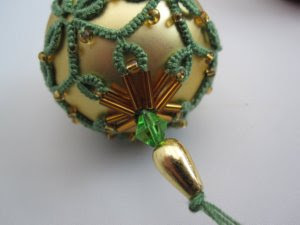 Very cute bauble, I like how you used the bugle beads and crystal and rice bead on the end!! OMG I just spotted the nicest one! Great job and thanks for including me on your list.